Much of this episode will be presented from generous contributions by the authors, Dr. Chris Schvarcz and Dr. Grieg Steward. What’s new: Now, Drs. Schvarcz and Grieg Steward, publishing in Virology, have discovered a new giant virus infecting algae that brings its own energy metabolism genes with it! Other viruses with other abilities, some of which host doesn't have? Viruses are not alive; they are generally regarded as molecular machines that parasitize living organisms in order to make more of themselves. One feature that separates viruses from lifeforms is that they do not have active metabolisms; they don't have to constantly produce energy to maintain themselves. But in recent years, as we've discovered and characterized new viruses from the environment (such as the ocean), we've seen more and more examples of viruses that actually encode genes for important metabolic processes. These are genes that we would have previously expected only to find in cellular organisms. The host for this virus is a type of green algae that lives in the ocean called Tetraselmis, and Tetraselmis can reach very high concentrations in coastal, nutrient-rich ecosystems. Blooms of Tetraselmis have been recorded in many places around the world, including near where this virus was isolated, here in Hawaii. In these bloom conditions of Tetraselmis, there is high risk of the water becoming depleted in oxygen (especially at night, when photosynthesis is not occurring, and all of the organisms are respiring). Under these conditions, the algae may be dependent on fermentation for energy production. So, for a virus that is trying to spread through a bloom of Tetraselmis, its success may depend on being able to maintain Tetraselmis's fermentation pathway long enough for the virus to complete its replication cycle. Many people are surprised to learn that our oceans are teeming with viruses. There are tens of millions in just a teaspoon of surface seawater. For those of us who like to spend time in the ocean, it is comforting to know that, even though we are swimming in a sea of viruses, we are not in any great danger of getting infected, because viruses are quite specific and virtually all of the viruses in seawater infect the microbial marine life. That’s good news for us, but bad news for things like phytoplankton that are very frequently being infected by viruses. Because phytoplankton are the food source that supports the entire marine food web via photosynthesis, we have been very interested in understanding how these phytoplankton are being affected by viral infections in the ocean. For this project, Chris Schvarcz, a graduate student (now a post-doc) working with me, set about trying to isolate phytoplankton and viruses from seawater so we could study them in the lab. Much of my earlier work on viruses in the ocean focused on the smaller, more abundant types of viruses; these are typically much smaller than the smallest microbial cells. However, there were hints, starting back in the early 1990s, that extraordinarily large viruses were lurking out there in the ocean that had yet to be identified. More recent work showed this to be true, so Chris tailored his methods to make sure we would not miss any really big viruses that might be out there. He ended up finding a rather large virus, the biggest phytoplankton-infecting virus that has yet been sequenced, which was quite exciting. The bigger surprise came when he analyzed the genome and discovered genes that code for two metabolic enzymes involved in fermentation. This is a metabolism that allows for energy generation in the absence of oxygen. Most people are familiar with fermentation as the process by which yeasts convert sugar into alcohol when making beer or wine. And here we are finding pieces of this pathway in a virus!? This raised the question of how these genes might benefit the replication of the virus, after all, it is infecting an alga that produces oxygen during photosynthesis! We think the answer lies in the ecology of the virus and its host. 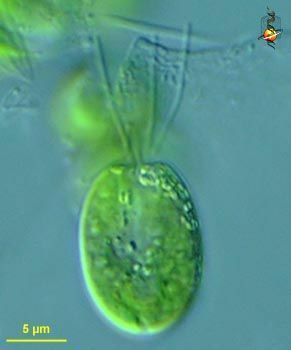 The host, a green alga in the genus Tetraselmis, occasionally grows to very high concentrations in coastal waters. Under these bloom conditions the cells are very close to one another allowing for rapid spread of an infection through the population. When alive and photosynthesizing, these algae do produce oxygen, but when a bloom starts to die (say from a viral infection tearing through), bacteria in the water start rapidly decomposing the dying algal cells and in the process use up all the oxygen in the water. Our working hypothesis is then that the virus, by carrying and using these genes, is able to spread more efficiently through intense blooms. Even as they trigger events that lead to the depletion of oxygen, they are able generate the energy they need to replicate by temporarily propping up the fermentation pathway inside the cells they are infecting. We have some experiments planned to see if the virus actually uses these genes in the way we think, or if instead they are using in these genes in ways we have not anticipated. It appears that the virus acquired the fermentation genes from the alga that it infects and this co-opting of genes by viruses from their hosts seem to be a common phenomenon. Once a virus acquires such genes they will evolve so that the proteins they encode carry out functions that are most beneficial to the virus rather than the host from whence they came. It is quite likely then, that the viral versions of enzymes will turn out to have changes in their properties: stability, kinetics, substrate specificity, or even an entirely new function. By characterizing the viral versions of what seem to be familiar enzymes it seems likely that we would discover some that will be useful for biotechnological applications. One of my favorite comments about this paper came from a colleague, Curtis Suttle, who tweeted "Another Giant Virus makes its debut, and it encodes genes for #fermentation, but most importantly, can it be used to make beer?” I thought that was great. A lighthearted, frothier view of the potential applications. And hey! Why not?! The time may be ripe for a giant virus lager. One thing this project showed us is that there is still a lot to learn about diversity of viruses in the environment all around us. From a single graduate student’s efforts sampling the ocean, we now have a whole collection of really interesting viruses that we are busy describing, including one with an even bigger genome the on described in this paper, and which encodes a whole suite of even more surprising metabolic genes. Figuring out how viruses use these genes will help us understand how they interact with their hosts, and ultimately how they are shaping the ecology of the whole marine ecosystem.